AMD has demoed a new low cost, low power mobile processor for netbooks and cheap notebook PCs. 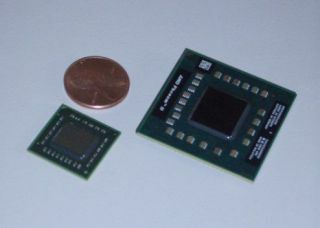 Known as Zacate, the new chip was shown giving Intel's much more complex and expensive Core i5 processor a spanking in several popular PC games. The demo took place in San Francisco as AMD cashed in on the presence of the tech community at the Intel Developer Forum (IDF). The basic details of Zacate go something like this. It's a dual-core processor based on AMD's new low-power Bobcat core and it packs an integrated DX11 graphics core. Rated at 18W, there will also be a 9W model known as Ontario. Both will be made by Taiwanese foundry TSMC in 40nm silicon. Overall, the new chip is tiny. Much smaller, for instance, than an AMD Phenom II quad-core processor. Smaller, of course, means cheaper. But more on pricing in a moment. Not much more is known about the new Bobcat core and the demo did little to change that. Instead, AMD focused on the graphics performance of Zacate. Surprisingly, AMD chose an Intel Core i5 laptop as the comparison platform. Core i5 is traditionally found in relatively expensive mid-range laptops rather than netbooks and cheaper portables. Nevertheless, Zacate was shown kicking out around 50 per cent more frames per second in the Batman: Arkham Asylum beat-'em-up. In the City of Heroes super hero game, the delta was more like 100 per cent. Admittedly, AMD was using a slightly elderly graphics driver on the Core i5 system. But the point remains – if Zacate has the edge on a Core i5 in games, it will absolutely destroy an Atom-powered netbook. Question is, will it actually compete with Atom? When AMD first introduced Zacate and Ontario, we got the impression they were very much a budget chip for netbooks. Now it seems AMD has higher ambitions for Zacate, pitching it as a competitor for Intel Pentium and Core i3 laptop PCs priced around $500 or £400. Despite the chip's impressive graphics performance, that might be a little ambitious when you factor in CPU performance. Still, the lower power Ontario derivative bodes extremely well for netbooks systems. It should make for £250 netbooks that run Windows 7 properly and can cope with both HD video and a little gaming on the side.